Understanding how to be happy is the most meaningful issue in my (and hopefully your) life! I believe we all desire happiness but most of us struggle in our understanding of what it is and how to get it. I have concluded that long-term happiness is really synonymous with living life successfully. On the whole, for me, this consists in excitedly pursuing well-chosen goals, keeping harmony among my goals, and enjoying both pride and a sense of fulfillment from achieving them. 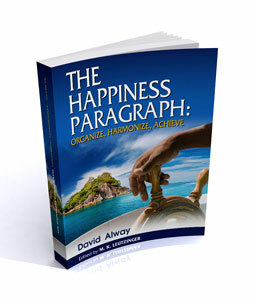 My ebook, The Happiness Paragraph, was born of my desire to clarify my own thinking regarding happiness. As I continue to explore these ideas I am also reading the key works of others who have written about happiness. If you would like to explore these ideas with me feel free to browse the various sections of this website. If you are interested in my review of a key work - then try typing the title or some key words into the search box below.